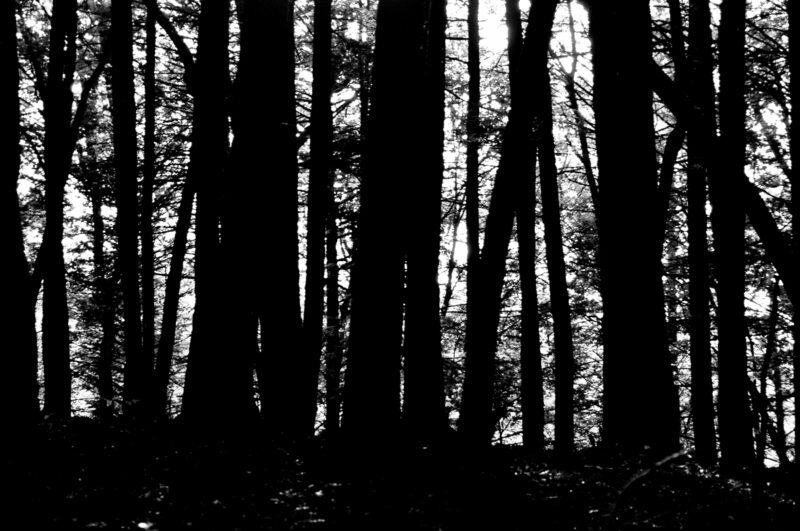 The haunted ford west of Summersville Lake may be forgotten, bite the site of the haunting may yet be determined. Paddlers who run the lower Gauley River may have gotten to know W.Va. Route 129 west of Summersville Lake in Nicholas County, but this tale of a strange haunting along the way may have escaped the attention of many. As summer rafting season is upon us in West Virginia, I thought it might be a good time to revisit the legend. 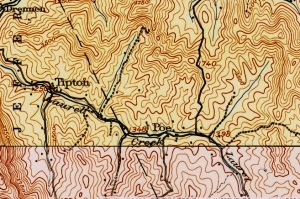 The tale of the “Ford Ghost” southwest of Summersville, West Virginia, makes its appearance several times in local lore, but this telling by J.W. Benjamin, published in the W.Va. Heritage Encyclopedia, couches the story in manner that captures the essence of a good ghost story with the help of Lonnie E. Legge, who might have provided enough detail about the location of the haunting to surmise where it occurred. 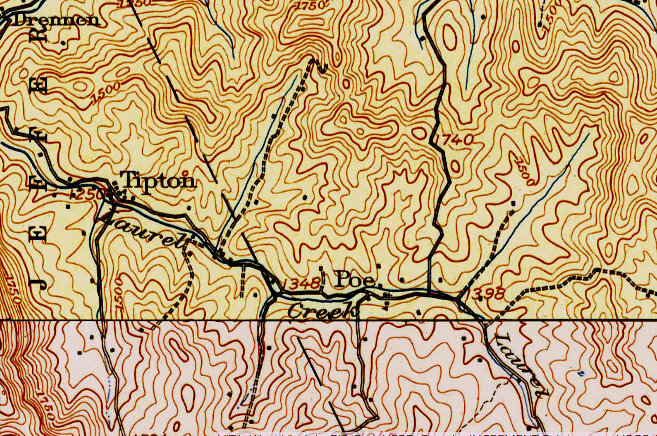 1918 Map showing locations on Laurel Creek near Poe, WV. People living on Laurel Creek in the shadow of Panther Mountain have heard of the “Ghost Ford” just below old Bethel Church. In the old days, before a foot-log and handrail were provided, the road forded the shallow stream there. In that dark, narrow little glen, the trees sloped sharply, and little sunlight ever penetrated to dance in the thin stream. Locked tree branches overhead formed a dark tunnel, and the laurel grew right down to the edge of the narrow, rocky road. At any rate, that was the setting about 1900 when this terrible thing happened to Lonnie E. Legge’s father’s friend. The story about the “Ghost Ford” got its start back in the 1870s. An old Syrian peddler tramping through the backwoods, selling dry goods and notions, was murdered at the ford, and his money and pack were stolen. With him was his pet slog, a big red collie. Its throat was slit from ear to ear. This dog always followed at his master’s heels, but the ghost of the slain man did not come back. Instead, the ghost of the dog showed up. It wouldn’t have been too bad if you had seen a collie trotting along by your side and the dog had quietly disappeared as you came to the ford. But this collie was different. In the first place, it was blood red. It could be seen on the darkest night, although there seemed to be no glow coming from the clog. And this collie paid mind no mind to the laws of gravity. It trotted along about three feet off the ground. Every now and then people walking toward the ford would see the big collie striding along through the air beside them. He usually joined his selected viewers maybe about a hundred yards from the ford and stayed with them until they started across the creek. That night the crowd of boys and girls passed the ford with much talking about, “Sure wish we could see that ghost” and “I’ll bet I could catch him!” It looked like a storm was coming up, and the boys were showing off their courage. After the meeting was over, the crowd left the church in high spirits. One young fellow, Charley Grose, was particularly brave, Legge reported. Charley said, “If that infernal dog tries to follow, I’m going to tie a knot in its tail then give him a swift kick.” Little did he know. 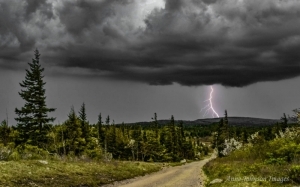 The storm that had been threatening all evening was approaching fast with flash after flash of lighting and crashing thunder that reverberated from mountain to mountain. In the dim tunnel, approaching the creek, the lightening gave everything an eerie, unreal appearance. The person walking beside you looked like a walking corpse. But the attempt was enough, Legge said. “Just then hell itself seemed to break loose. The apparition whirled over on its back with smoke and fire flying out of its nose and mouth in three streams, and the smell in the air was like being close where lightning as struck, while a loud crack of thunder sounded at the same time. They finally stopped and counted noses. Everyone was there except poor Charley. They decided the ghost had gotten him, or in the headlong rush he fallen and maybe broken his neck. There in the darkness and storm stood a frightened crowd of young people. No one remembered seeing Charley and seeing him grab at the dog. “When the rest of us caught up with Charley, the smell of lightning was still strong, and he was sure one scared boy,” Legge recalled. Who wants to call it mass hallucination? It was a ghost. That’s what it was—the ghost of a big red dog. To prove it, a man, his wife, and her mother also saw a ghost at the same place a year or two later. They all swore it was a ram. The probably got mixed up with the story of the dog breathing three streams of fire and one of those old pictorial Bible books showing a ram being sacrificed. They just didn’t recognize the ghost of a collie when they saw it, that’s all. And if you want to walk the path near Panther Mountain, past Ghost Ford on Laurel Run, even today there is many an old-timer or two around who will point out the way. Try it some dark night when the moon is down and the wind is whimpering through the writhing branches and the sulfurous smell of an electric storm is in the air. The striking beauty of lightning photography in West Virginia.